How To Deploy Software Updates Using SCCM 2012 R2 In this post we will look at the steps on how to deploy software updates using SCCM 2012 R2. Deploying the software updates for the computers is essential, the software updates are released by major software vendors to address security vulnerabilities in their existing products. To stay protected against cyber-attacks and malicious threats it is very important that you keep the computers patched with latest software updates. Software updates in System Center 2012 R2 Configuration Manager provides a set of tools and resources that can help manage the complex task of tracking and applying software updates to client computers in the enterprise. Talking about software updates, in SCCM 2012 R2 there are few new features added which includes a new maintenance window dedicated for software updates installation. This lets you configure a general maintenance window and a different maintenance window for software updates. When a general maintenance window and software updates maintenance window are both configured, clients install software updates only during the software updates maintenance window. A new feature called Software updates preview lets you review the software updates before you create the deployment. In this post we will see the steps on how to deploy software updates using SCCM 2012 R2. If you are looking for SCCM 2012 R2 step by step guides click here. There are 2 ways to deploy software updates using SCCM 2012 R2, Manual and Automatic. In Manual software updates deployment, a set of software updates is selected the Configuration Manager console and these updates are deployed to the target collection whereas Automatic software updates deployment is configured by using automatic deployment rules. This method is used for deploying monthly software updates and for managing definition updates. When the rule runs, the software updates that meet a specified criteria (for example, all security software updates released in the last week) are added to a software update group, the content files for the software updates are downloaded and copied to distribution points, and the software updates are deployed to client computers in the target collection. In this post we will see the steps to deploy the software updates manually and for automatic software updates deployment, there will be a separate post. To start with, install the Software Update Point role first. Launch the Configuration Manager Console, click on Administration, expand Overview, click Site Configuration, click on Sites. At the top ribbon click on Add Site System Roles. From the Add Site System Roles Wizard, click on Software Update Point and click Next. For WSUS Configuration, select WSUS is configured to use ports 8530 and 8531 for client communications and click Next. When you install WSUS, you can specify whether to use the default Internet Information Services (IIS) website or create a new custom WSUS website. As a best practice, select Create a Windows Server Update Services 3.0 Web site so that IIS hosts the WSUS 3.0 services in a dedicated website instead of sharing the same website with other Configuration Manager site systems or other software applications. When you use a custom website for WSUS 3.0, WSUS configures port 8530 for HTTP and port 8531 for HTTPS. You must specify these port settings when you create the software update point for the site. For WSUS Server Connection Account, click Use credentials to connect to the WSUS server, click on Set and choose the account. The account provides authenticated access from the site to WSUS server. Click Next. Click Synchronize from Microsoft Update and click Next. Click Enable synchronization on a schedule and let the schedule be set to default (simple schedule). You may also click Alert when sync fails on any site in hierarchy. Click Next. For Supersedence behavior, select Immediately expire a superseded software update. Click Next. Select Critical Updates, Definition Updates and Security Updates. Note that you can do this after installation of SUP. Click Next. Choose the products that you want to synchronize, in this step I have selected Windows 7, Forefront Endpoint Protection 2010. Click Next. Choose the desired language, click Next. The Software Update Point role has been installed. Click Close. In the configuration manager console, click Software Library, expand Overview, click Software Updates, click All Software Updates and at the top ribbon click Synchronize Software Updates. 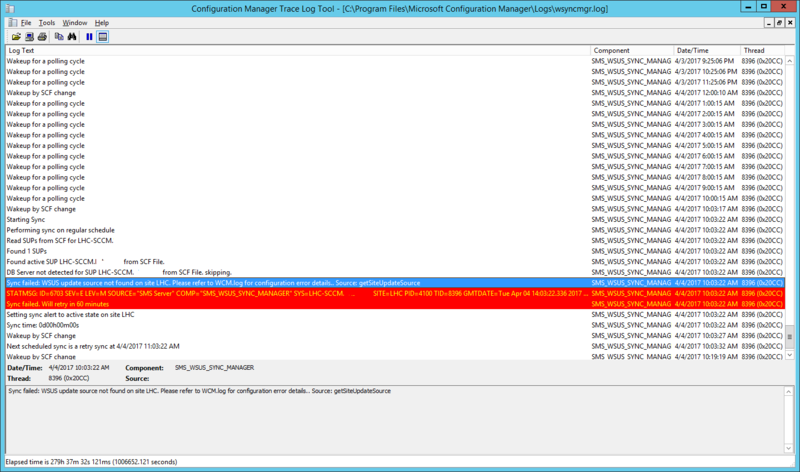 To see what’s happening at the background, you need to have 2 files opened wsyncmgr.log and WCM.log file. Below is the screenshot of the wsyncmgr.log file and we can see that the WSUS is synchronizing the categories and updates. The synchronization is completed. The software updates can now be seen when you click All Software Updates option in CM Console. Note that the updates are yet to be downloaded. Out of all the updates we will not deploy all of them rather we will filter the updates by adding criteria. Click on Add criteria. Select Expired, Product, Superseded, Bulletin ID. Click Add. Choose the product as Windows 7, Bulletin ID as MS, Expired as NO, Superseded as NO. Now select all the updates (hold Shift+page Down), right click on the updates and click Create Software Update Group. Provide the name to the software update group as Windows 7 Update group. Click Create. Click on Software Update Group and you will find the software update group that was created in the previous step. Right click on the Windows 7 Update Group and click Deploy. 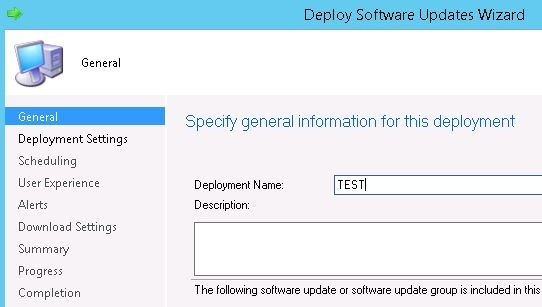 On the Deploy Software Updates Wizard, provide a Deployment Name, description and choose the collection for which this software update deployment must be deployed. Click Next. Set the Type of deployment as Required and detail level can be set to Only success and error messages. Click Next. Configure the schedule for this deployment, set the Time based on to Client local time. Choose Software available time to specific time and set the Installation deadline to as soon as possible. Click Next. On the User Experience page, you can choose to suppress the restart for Server or Workstations. Click Next. For Deployment options, if a client is within a slow or unreliable network boundary then select Download software updates from distribution point and install. If the updates are not available with preferred DPs then select Download and install software updates from the fallback content source location. Click Next. Create a new deployment package by providing a name, location for the Package source and Sending priority. Click Next. Add the Distribution Point and click Next. For Download Location choose Download software updates from the Internet. Click Next. Choose the language and click Next. The wizard will now download the updates and deploy them to the collection as per the schedule defined. Click on Close to close the wizard. After few minutes we see that the updates are installed on one the client machines in the collection and there is a notification that system needs to be restarted. You can choose to restart the computer by choosing Restart now or you can choose Snooze and remind me again in hours. Hi Prajwal, last week we started deploying Windows Server 2016 in our environment. I am able to see patches for Windows server 2016 in WSUS however they all do not show up in Configuration Manager Console except for KB4462917. I heard people saying this is known issue while others say, Windows Server 2016 all patches supercede previous ones. 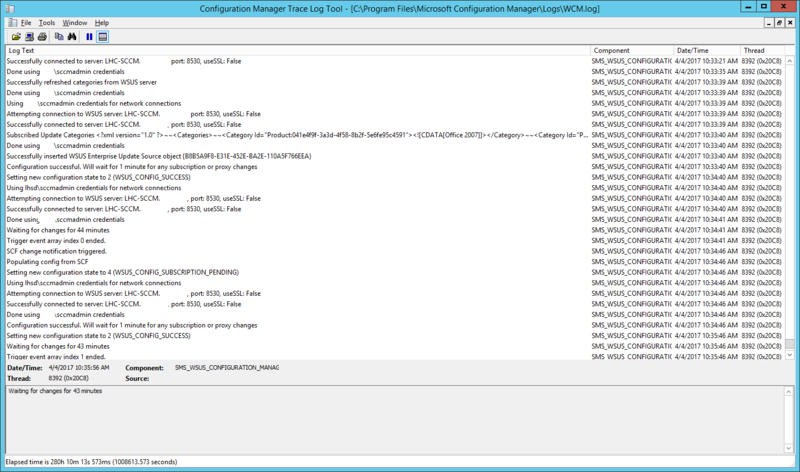 My environment is System Center Config Manager 2012 v1702 5.00.8498.1711. I would appreciate your kind suggestion. Thanks in advance. Updates are superseded if they are the monthly cumulative ones. If you go to your SCCM console > Administration > Sites > Configure Site Components > Software Update Point, you can see if you are removing superseded updates immediately or after a specified time. Hi What are the implications of removing and reinstalling existing SUP? The IIS is not showing sms or cms in application pools like the other SUP. We have 2 SUP. I’m getting wsus error messages from sccm 2012 console. It is fine to remove SUP and install SUP. There should be no issues. Do we actually need wsus to download the patch as well or will the SCCM take care of it as long as wsus service is on? SCCM uses WSUS in the background to download and deploy updates. So yes, WSUS is required. I have a question about the “Install Software Updates” task in a Task Sequence. There are two options which you can select in the task, namely “Required for installation – Mandatory software updates only” and “Available for installation – All software updates”. What do these options mean? Does the first option mean that all the required updates for the concerning OS will be installed? And does the second option mean it will only install the updates deployed to a collection? “months to wait before a superseded software update is expired”. in my environment , currently its set to 1 months however client want to change it to 3 months. can you help us to know what can be the impact of this by changing this from 1 to 3 months? Hi Prajwal , I Need Your Support Please Because After I Downloaded Windows Update And Deployed It Successfully One Of My Team Removed the Downloaded Updates from It’s Sources And when I tried To Install Windows Update Again It Fail Because I think Its already Downloaded and Took Content Id Number And Status is Downloaded so How I re download windows update again from Microsoft Updates again ?? Hi Prajwal, I have just installed SCCM 2012R2 and upgraded to 1710 version. So, I installed WSUS and Update Point and I tested the deployment successfully. My two clients, Win 7 and Win 10, are compliant with 100%. I found, on the clients, all the required updates using Control Panel and History. The strange thing is that no updates are shown on client Software Center. All the tabs are empty. is this normal? I have followed your steps, but the clients dont recieve any updates. I dont even have a windowsupdate.log on the clients. I am syncing updates fine from wsus to sccm, but I cant get updates to move from sccm to clients. I am at a loss of what is my issue here. Any help would be greatly appreciated. Great write up! I have a queation. When adding the updates role to the sccm server… Windows 10, Exchange 2013 and other more recent technologies are not listed in the options for updating… how do I get these to appear? Did you run the initial sync ?. That updates the products and classifications. Prajwal… no I had not. I’ve done that now and we are in business! What is the best practices between the test environment and production environment for the update software push. I mean how many days waiting after my test to push in production? The guidance you have posted has been great. Do you have anything for offline networks? I have a wsus server internet connected, did the export/import into the disconnected SCCM/WSUS. Synchronized the SCCM. When I try to setup the deployments I am having issues with the Deploy Software Updates Wizard – where should the download location point to? Should I point to the location of the WSUSContent (import) or the SCCMContentLib? I’d like echo Moe’s comments as well. Prajawal, you save a lot of us Noobies headaches with your blog. Very clear and simple to follow. I just want to thank you. Your Blog is my definitive GoTo when I want to understand how things work or need to be configured in SCCM. You explain things simply and have pictures as well. You and all your effort is appreciated by me …Just a Humble SCCM N00b and a big FAN of yours! Thank you so much 🙂 Happy to read such comments. Estoy realizando despliegue de Updates a equipos Windows 7 y Windows 10, desde el monitor de sccm pasan equipos como completado compliant pero cuando voy al equipo cliente no hay actividad del deployment ejecutado.saben que podría ser? Y desde la herramienta monitoring deployment indica resultados satisfactorios. Check the folder and share permissions on the location where you selected to download the patches to. Both the share and the folder need to be open to write access by SCCM. Every time I try to download any update from SCCM, I get the error. Failed to download content id 16839922. Please help. First I love your guides! The time you have put in for the community is beyond appreciated! I am trying to learn SCCM as I follow your guides step by step. Here is what I am getting, and any help is beyond appreciated. How is it possible to make the package install before on some deployment group to validate theres is no regression ? Also, we starting on this, and we are afraid there are a lot of udpates needed on our client systems, that will annoy users with 12348 reboots until all KB have been installed?? under Software Update Component properties, deselect all Products and Classifications which are enabled. Next run the Software Update Synchronization. Once it is complete, enable the required Products and Classifications that were disabled previously, and run the synchronization again. Let me know if that works. Thanks. So I was able to get that to work. Now when I synced SCCM to WSUS I only see windows 7 updates. I looked in WSUS & I have multiple types of updates not just Windows 7. I noticed the WSUS content folder only had a few folders. I’m not sure what else to do. This is all after a restore. I think I failed to install SCCM on the correct drive. I also don’t see my \servernamesourcefolder. Is it possible to uninstall WSUS without any issues? Thanks. I was able to get that to work. Now when I synced SCCM to WSUS I only see Windows 7 updates. I looked in WSUS and have multiple categories and products as far as software updates. I noticed that my WSUS content folder only contained a few folders. I’m not sure what else to do. This is all after a restore. I think I failed to install SCCM on the correct drive during the restore. I also don’t see my \servernamesorcefolder . Should I just start the restore over? Is it difficult to uninstall WSUS? I got that fixed thanks. I did notice that my content folders are empty after the restore. I had a lot drivers etc I wanted to bring over. Do I have to manually copy that information? I never get prompted to create a deployment package? What am I missing? I want to change the maximum run time (minutes) for software updates by default is 10 min and want to change it for 30 min. I know I can do it for every update manually. But how can I change it so that i don’t have to do it every month for the update. By default it should be set for 30 min. i deployed security update via sccm and it recorded complaint for all the windows servers 2012 rs but when i log in to the servers the updates are not recorded on the add and remove programs. why does SCCM behave that way for windows server 2012r2 because windows server 2012 and 2008 r2 shows the update deployed via sccm. Sorry to bother you, I have a critical issue in my SCCM 2012 R2, I try to troubleshoot and find the root cause but no luck, could you mind check my attachment file and take a look. Please advise me how can fix this issue, thx. Thank you for your great how to steps Prajwal!! 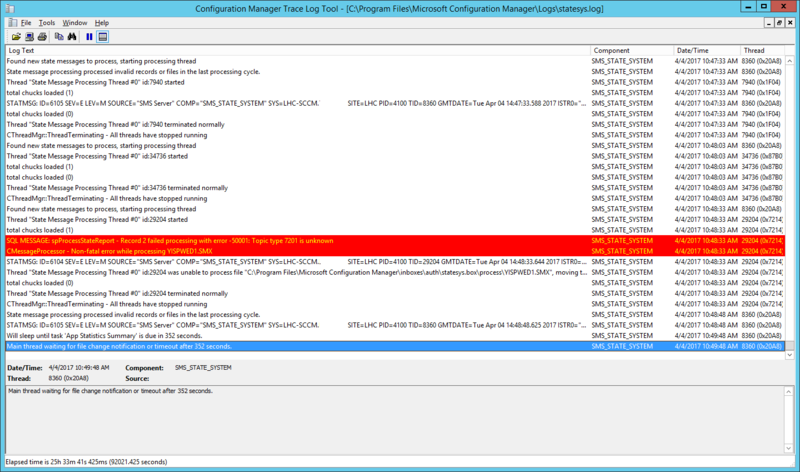 Is WSUS required for SCCM to manage updates? Since you can point SCCM directly to the Microsoft update servers couldn’t you do this without WSUS running? I have an environment with 100 systems I need to manage so I’m trying to do this as simple as I can. I have no need for secondary sites since everyone can hit my primary site. Thanks again!! Software Update Point for Internet-Based Client Connections – This basically allows you to manage Configuration Manager clients when they are not connected to your company network but have a standard Internet connection. I have configured SCCM for updates but got errors. Attachment has the scenario.. WCM and wsyncmgr log files.. The above issue is solved. My Internet Traffic was passing through a firewall and by allowing the ports 8530 and 8531 on my firewall, the updates started downloading. I have 2 separate servers, one for WSUS and one for SCCM. I will like to use SCCM to get the updates from this WSUS server. Do i add site system role or create site system server? or both? I am new to sccm, and learning how to deploy updates. After creating the software update group and then going to deploy, during following the steps i am not prompted to create the deployment package. Am I doing something wrong or missed a step? Did you get any info on this? I have same issue. The ‘deployment package’ process is not even in the wizard. I’ve done a deployment, and it’s saying deployed in the deployment package, however the client doesn’t appear to be receiving the updates (the updates have been downloaded to the “sources/updates/windows 7” folder on the SCCM server.). I took a look at UpdatesDeployment.log on the client however nothing seems to be standing out (the only thing would be “No current service window available to run updates assignment with time required = 1”). Hi Prajwal, can you configure where the site server should store all these updates? I’ve got a separate hard drive for it but I don’t see an option. Share a folder on that drive and you can store the updates. Can you please explain to me how the software update deployment process will work, if I install a new machine in the environment? I installed it via MDT task sequence, added it to the domain, it has SCCM client installed, I even added the machine to the Device collection for which I have set automatic updates. Will the Automatic Deployment Rule apply to the newly added server as well? Or are there some updates that have to be installed manually?